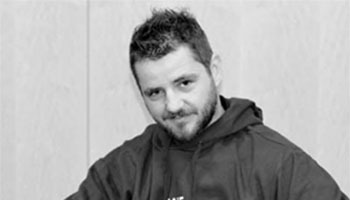 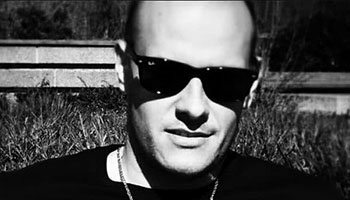 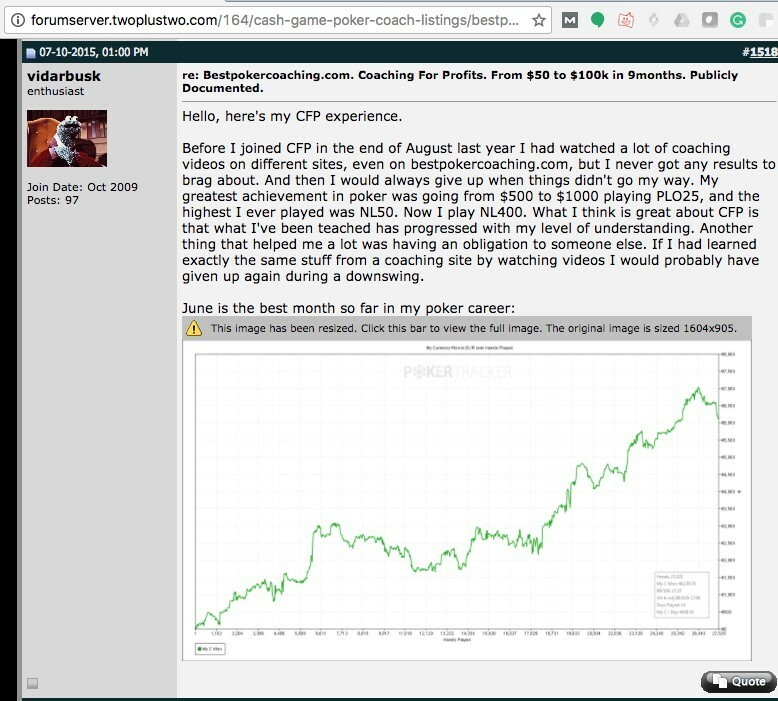 Maciej “Nubson” was an NL25-50 SH poker player, but when he started Coaching for Profits program he changed to HU. 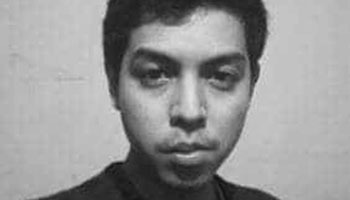 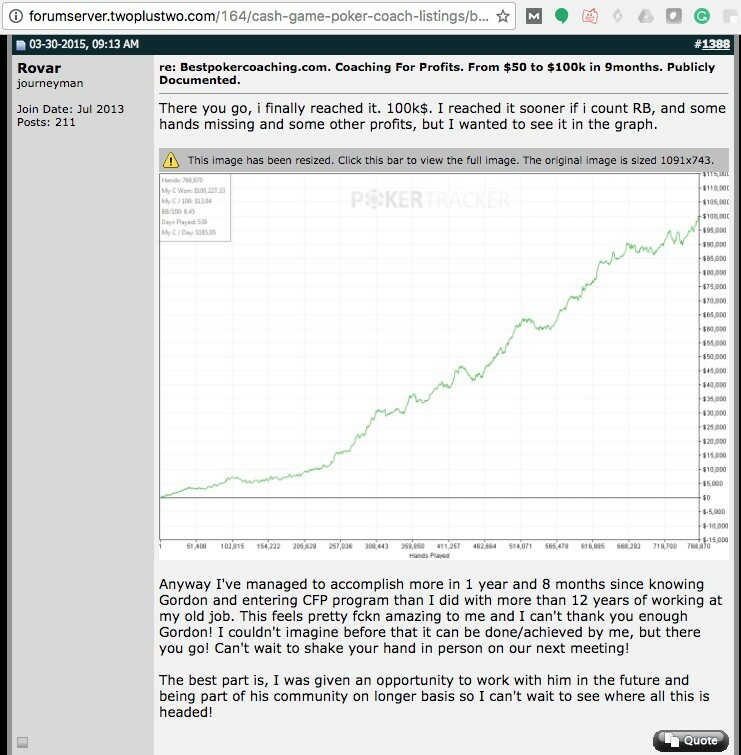 How could someone that never played a HU hand before win the monthly rankings 3 times, as a student, and then becoming a super HU coach? 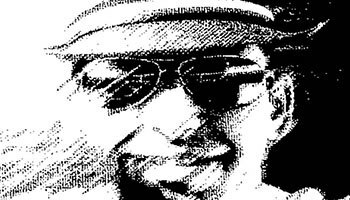 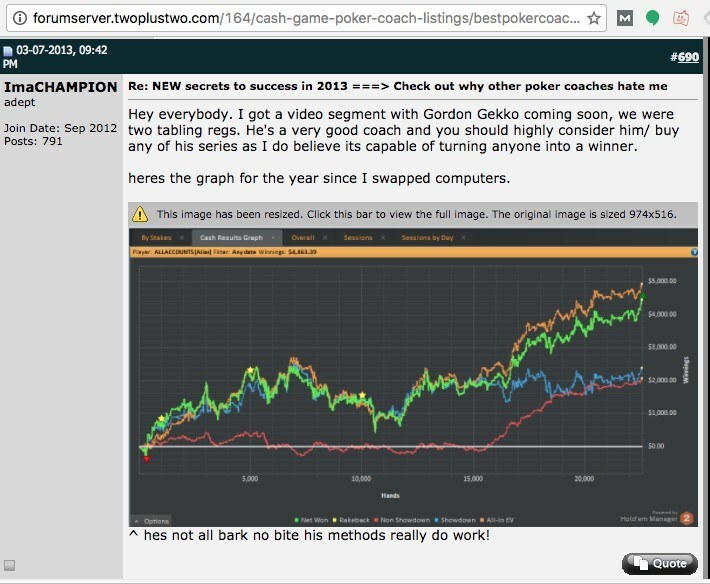 We will try to show you his secrets, and you can also follow all the steps, in his blog here at Best Poker Coaching. 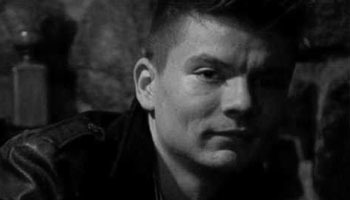 Nubson and his girlfriend enjoying the unplugged moments. 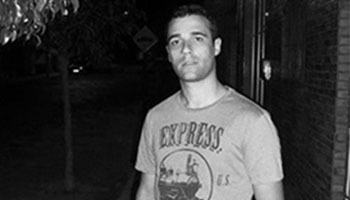 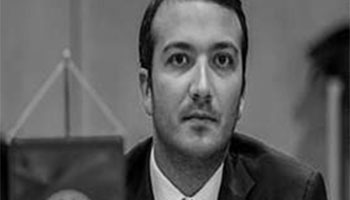 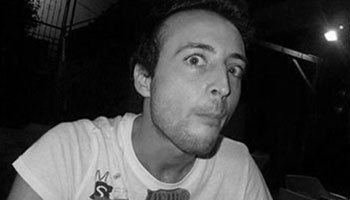 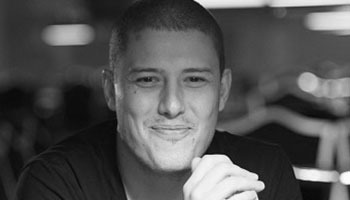 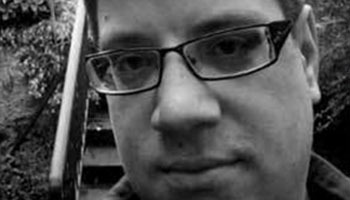 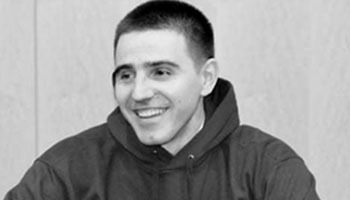 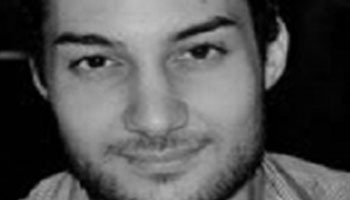 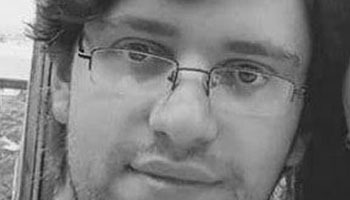 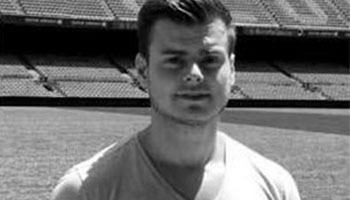 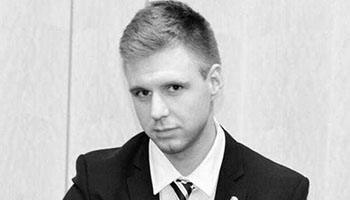 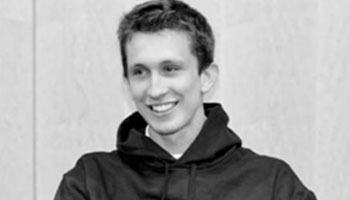 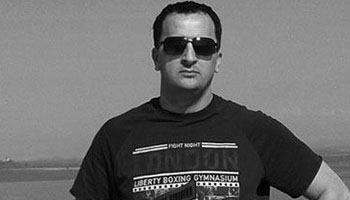 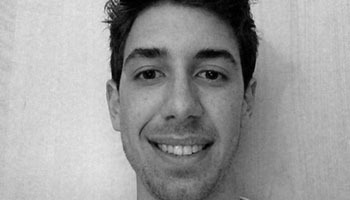 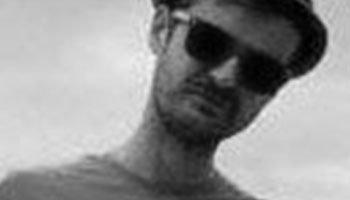 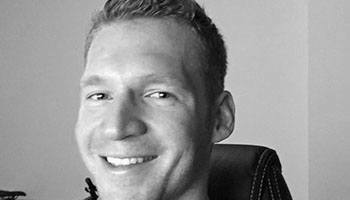 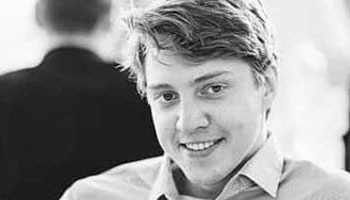 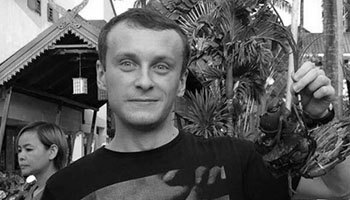 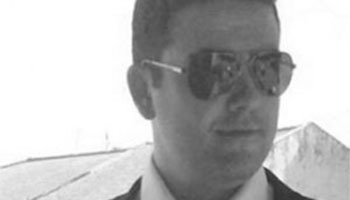 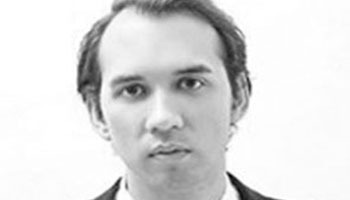 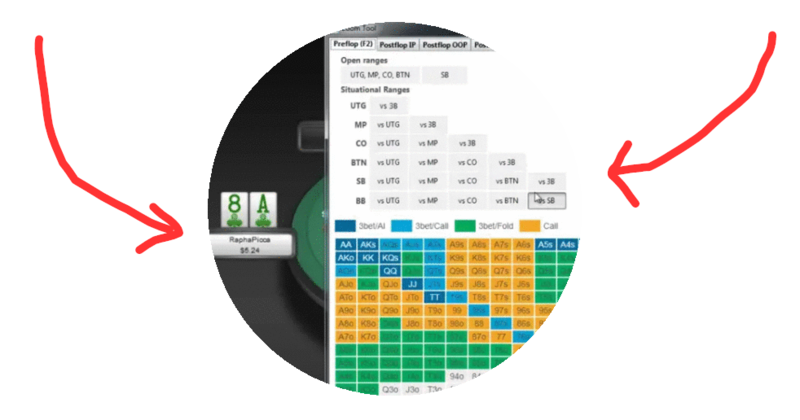 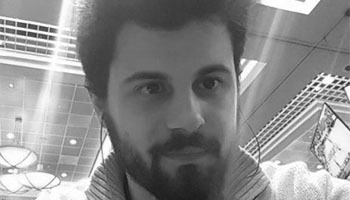 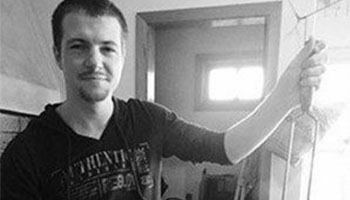 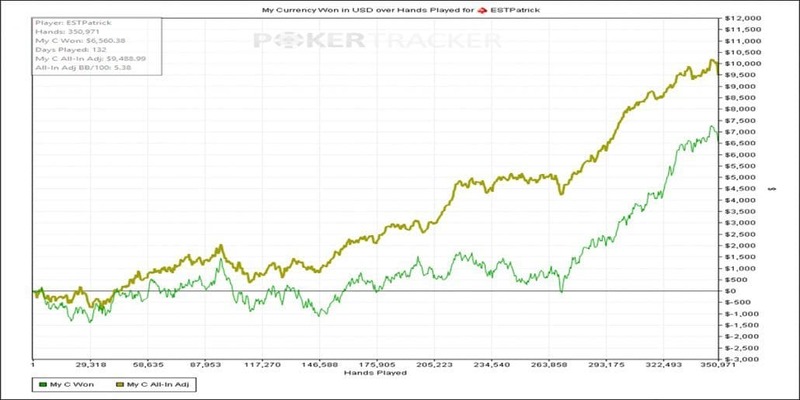 Around the time Maciej was in his IT studies’ second year he found out about SNG freerolls. 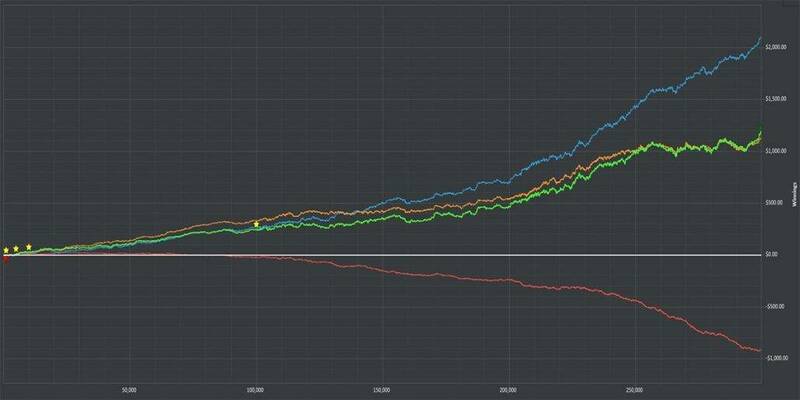 Grinding hours and hours, in the 10-man freerolls SNGs, with only 10cents prize pool, he got to a $20 bankroll. 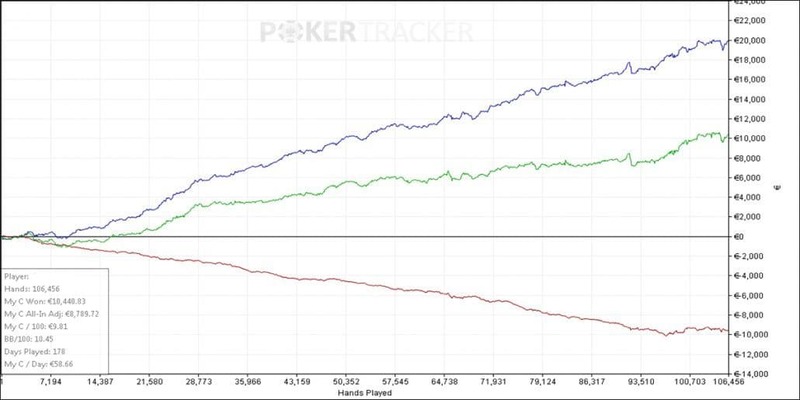 He then switches to cash games, where he continues to increase his bankroll, still without putting his own money, investing his time and skills in a Non-Deposit bonus at Full Tilt. 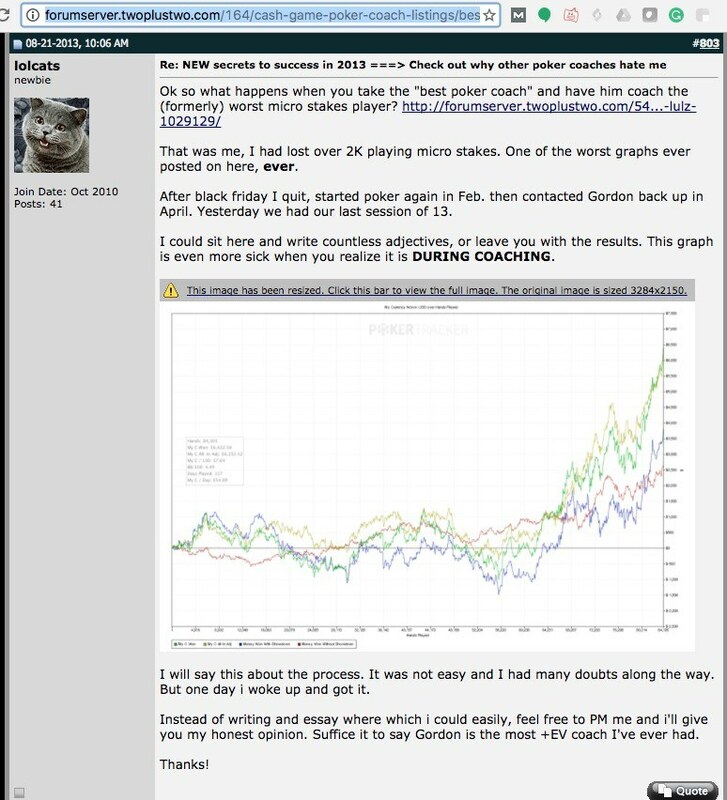 He was now a Micro Stakes Grinder that could get a few hundred dollars a month. 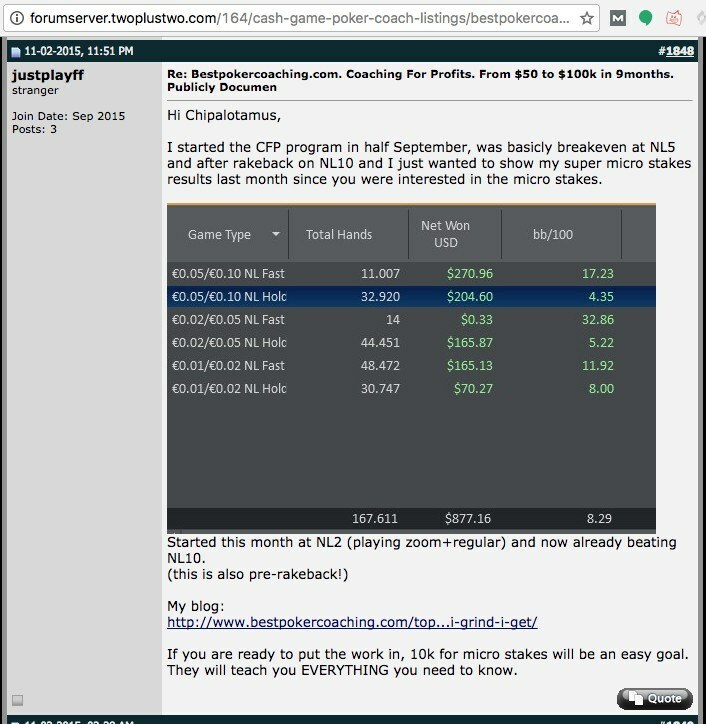 Always improving, he even set his own record month of winnings, with $1000 playing at the micros. 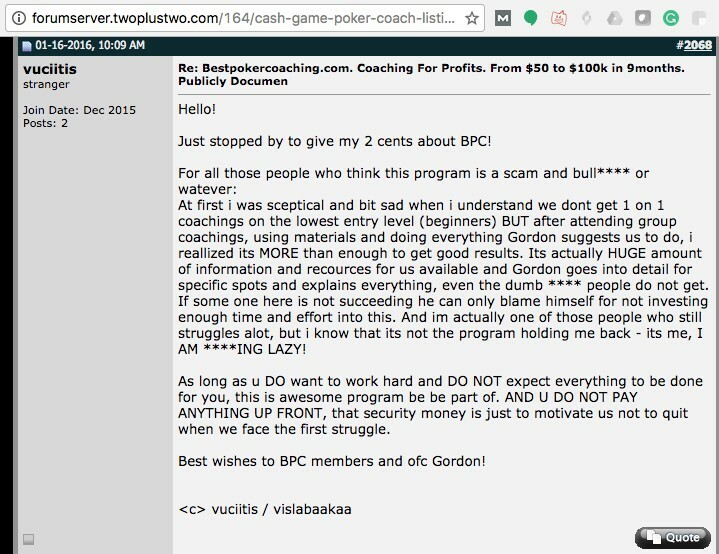 He was no stranger to poker coaching, but he never tried BPC, and maybe that’s why he was still not winning enough money. 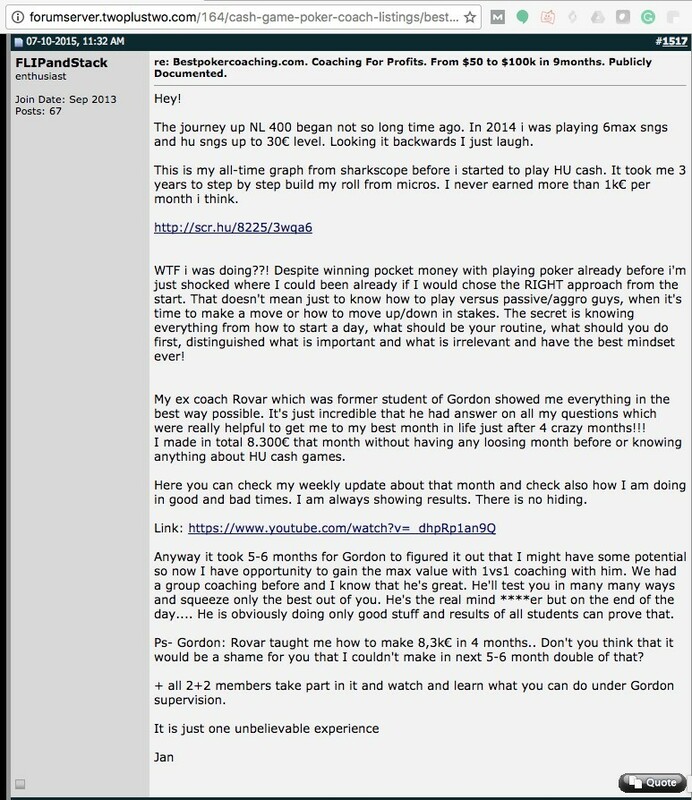 So in August 2014, he made his first post at BPC and one more life started to change. Like all CFP finishers, we had audacious goals, especially for someone who started playing HU from scratch. 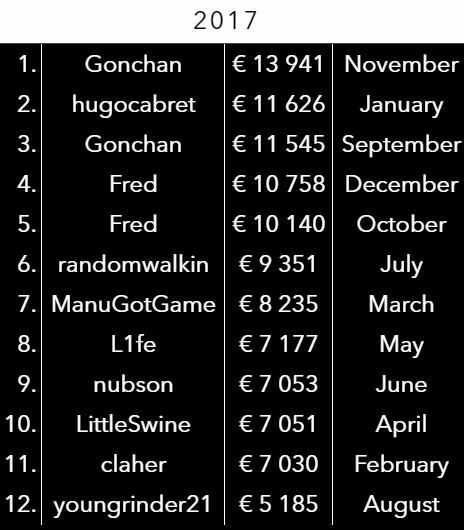 He started really strong, making 5k€ in his first month. 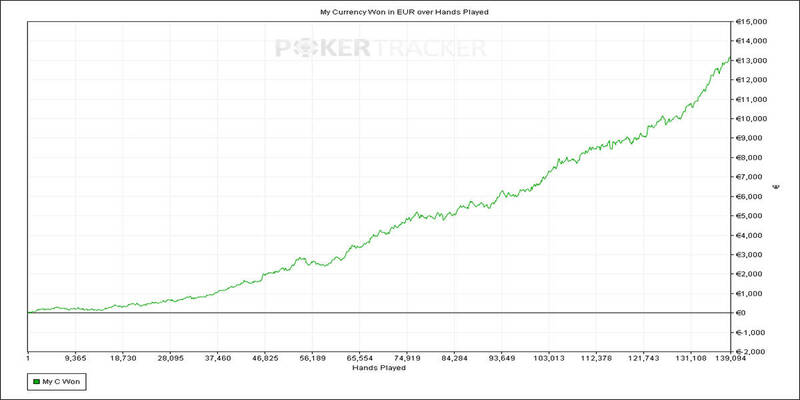 Who wants to win $1000 in a month when you can make 1000€ in a day? 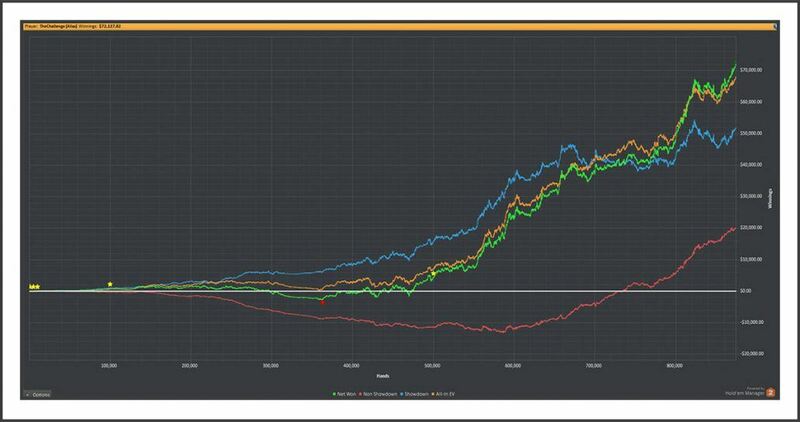 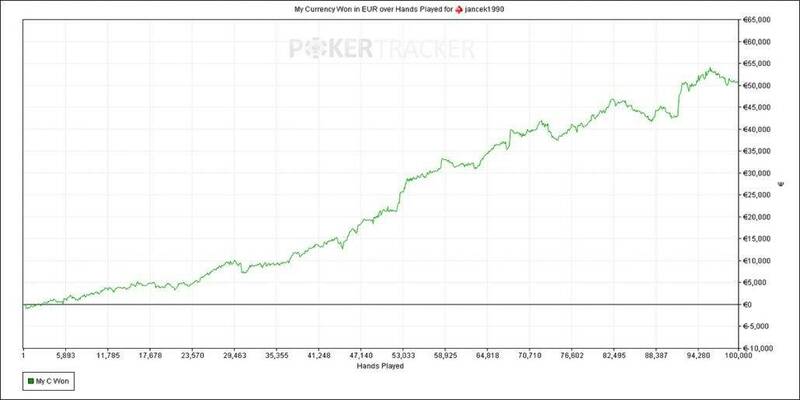 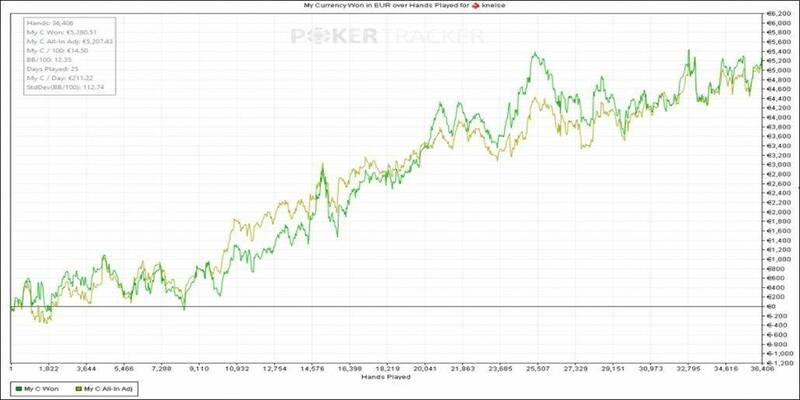 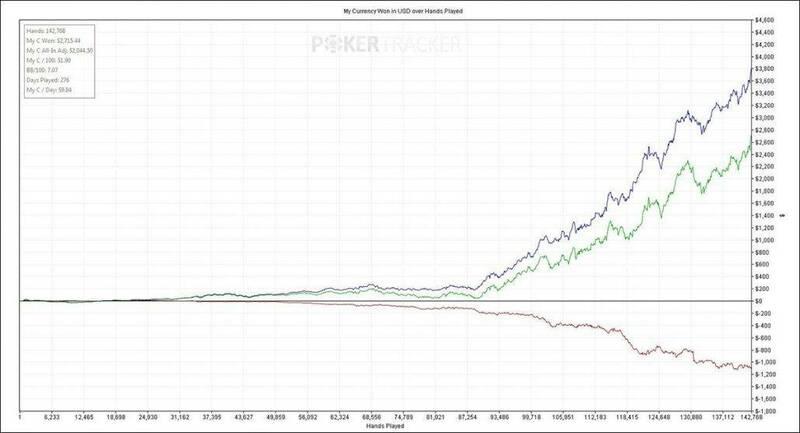 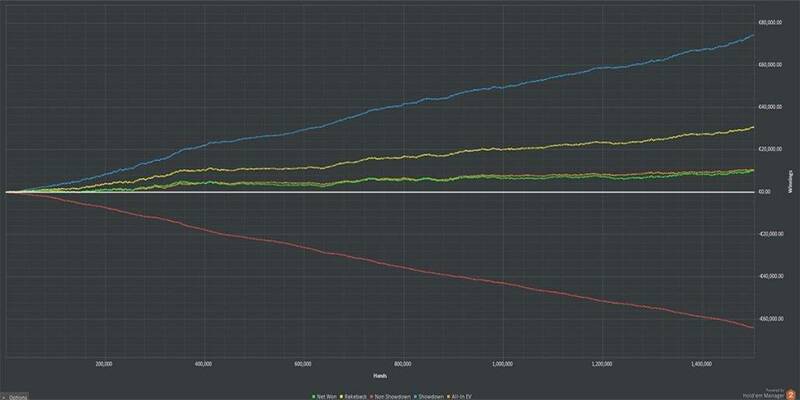 In April 2015 he shared the graph below, a Sunday ten hours session that ended up with 1000€ profit. 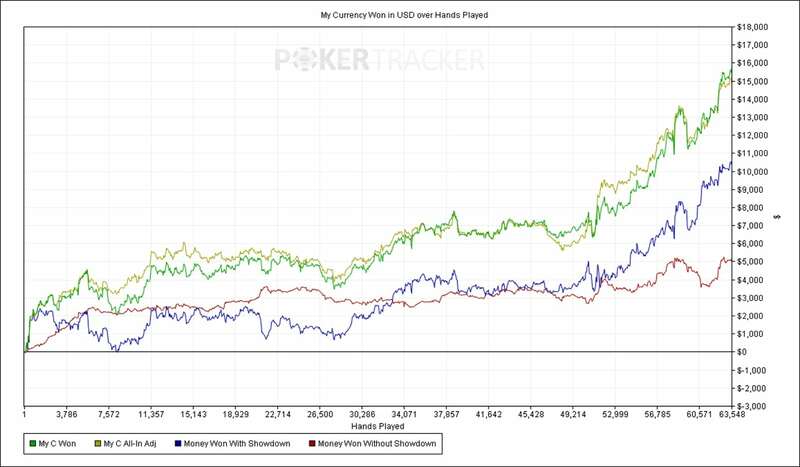 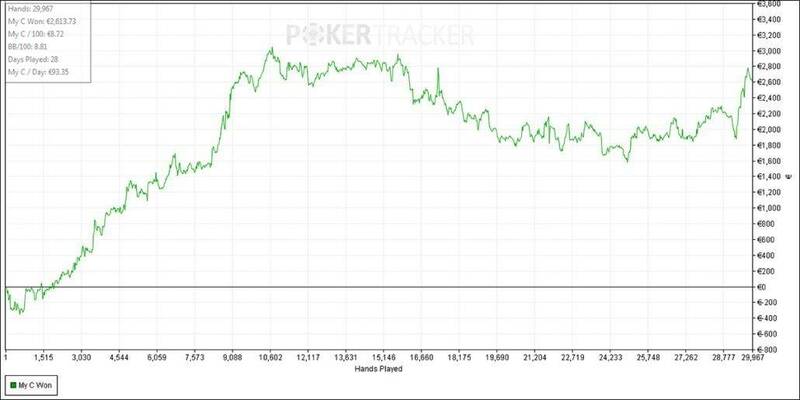 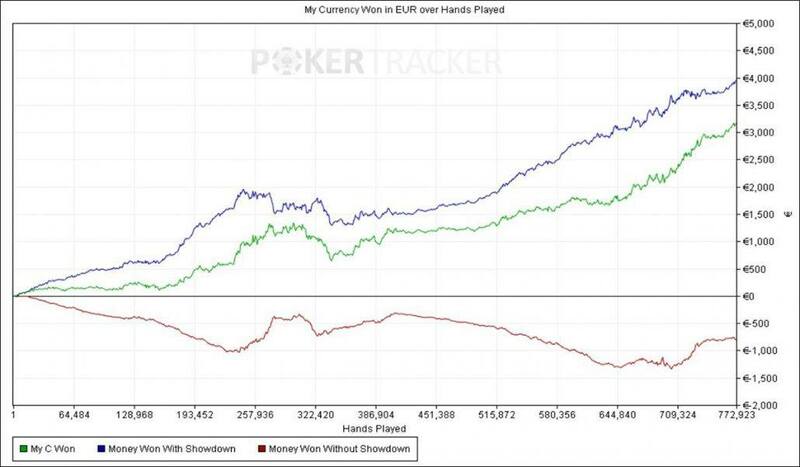 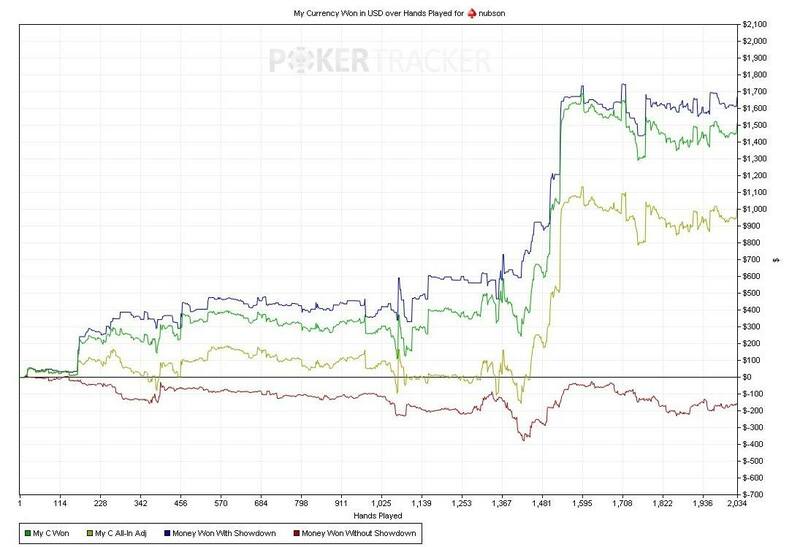 Maciej’s graph of the day he won 1000€ playing poker. Grinding and studying, the man that began from freerolls achieved in May 2015 his first €10.000 month. 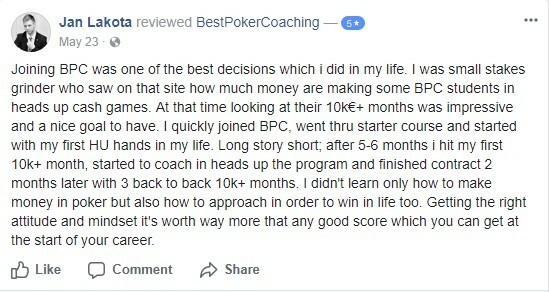 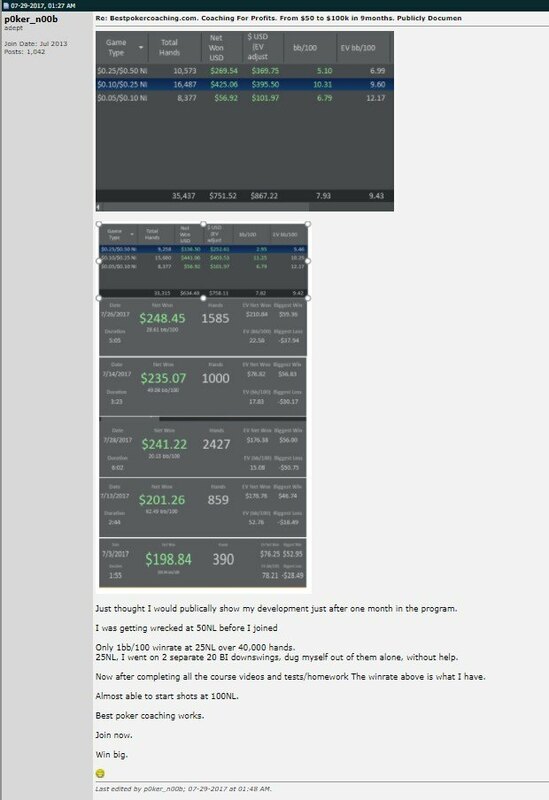 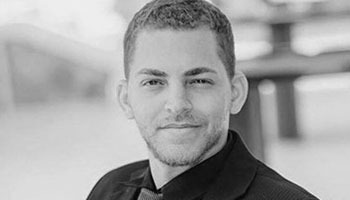 Looking back at his start, where the most profitable month for him before CFP was $1000, we can add Maciej as one more testimonial that proves why we can call ourselves Best Poker Coaching. 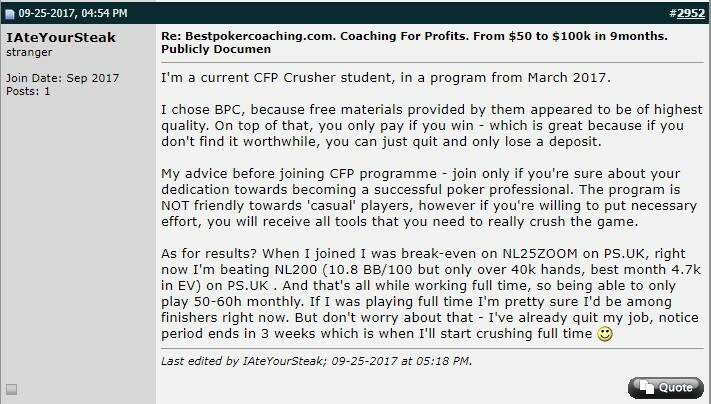 Still, CFP HU contract for Nubson was 60k, and by July 2015 he was halfway, feeling he had to give more, so he could receive more and faster. 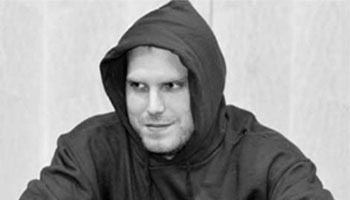 Every good story has at least one magic moment, where the hero, against all odds, beats a villain. 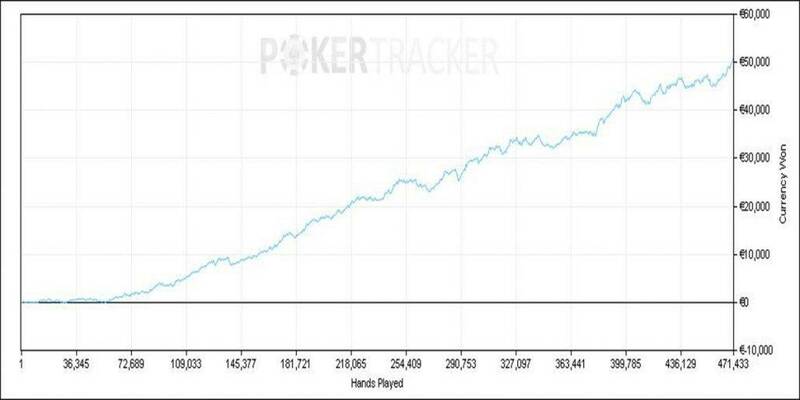 Although, in this story, the odds were on the hero side. 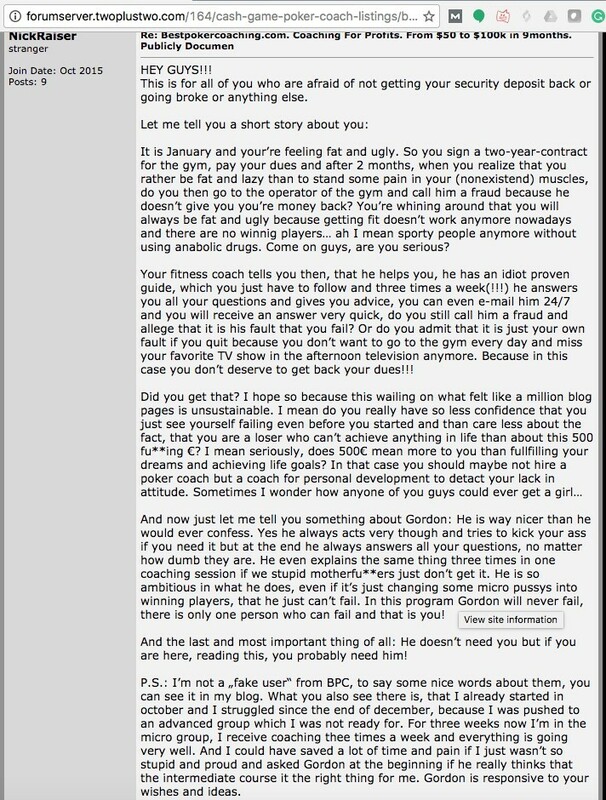 Still, the bad beats he took were bad enough to destroy anyone’s confidence. 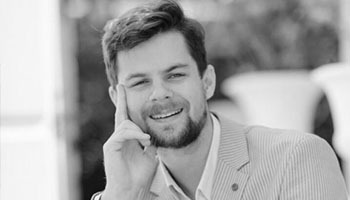 The July 2015 BPC seminar must have been the magical moment, where he was inspired and received the strength, courage and knowledge to continue the fight. 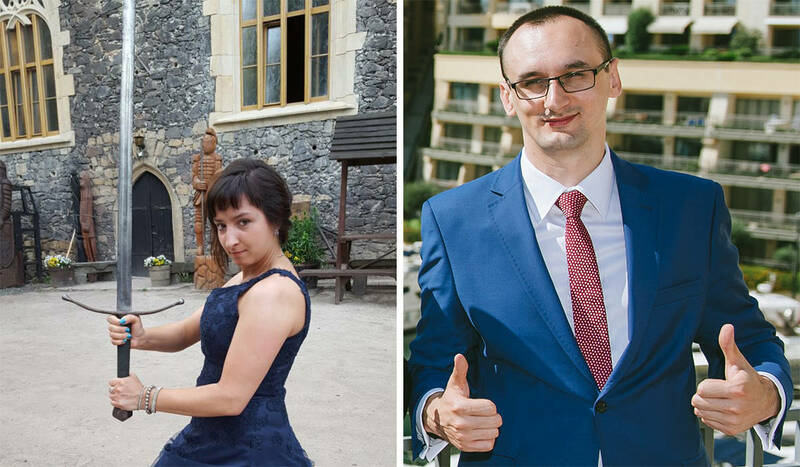 Having someone always by his side also helps to keep the head … in the game. 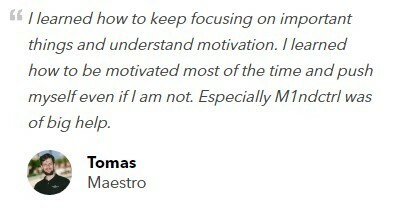 So, even while running 7k€ under EV, he stayed focused and continued to work. 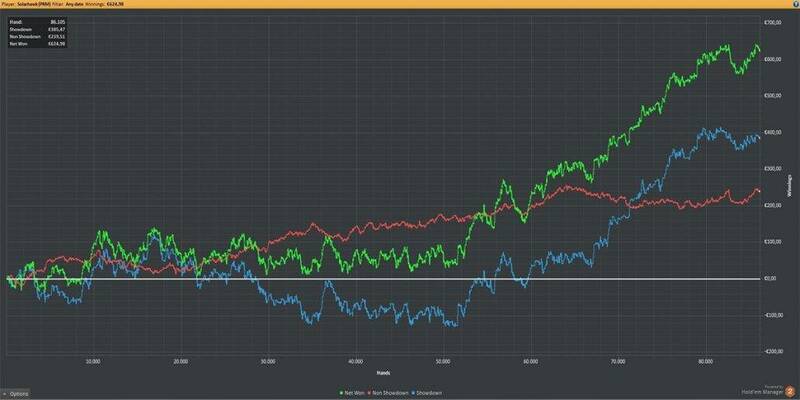 His resilience and the way he stood committed when this absurd downswing hit his game, show us that CFP gives you skills beyond poker. 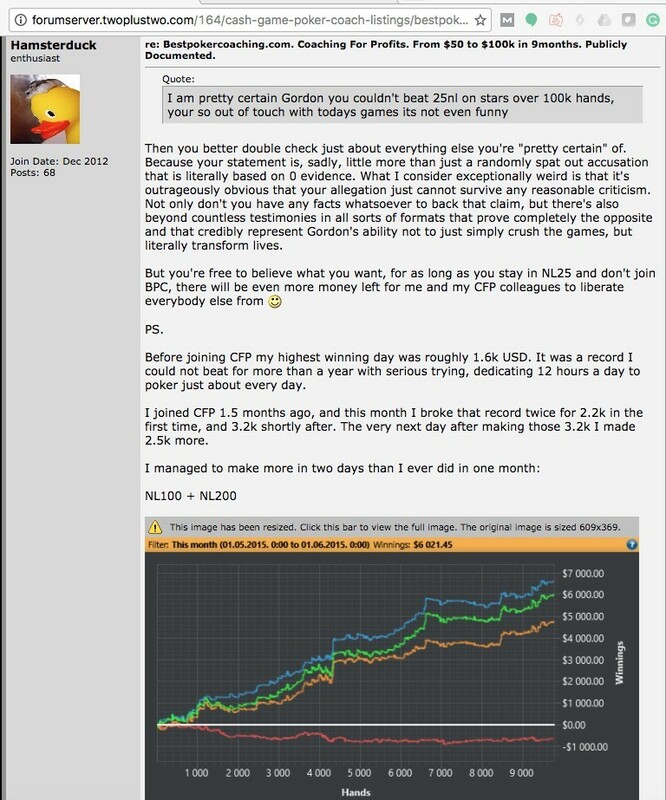 It must have seemed like years to him, but it was only a question of months until he got a new 10k€ month. 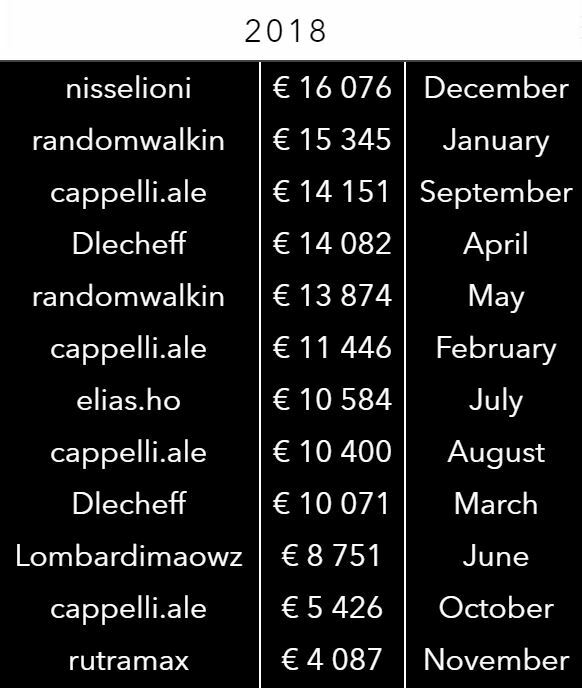 Not only he reaches the goal of finishing his 60k contract, he also did it with style. 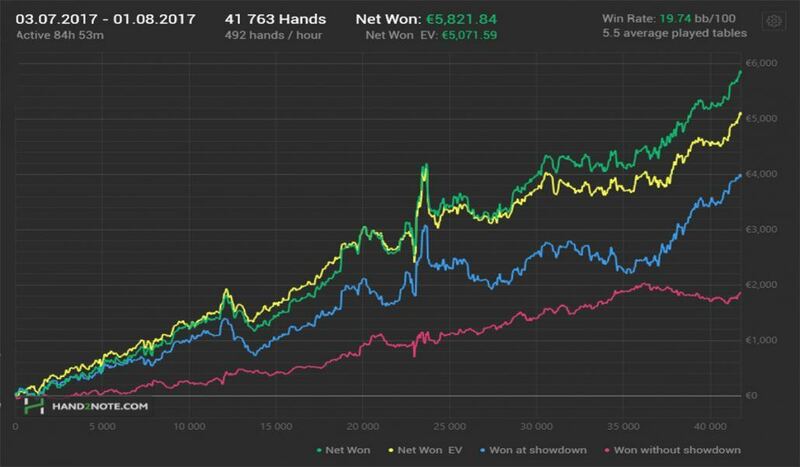 In the second-best session in the CFP HU record history, he had made a 4k day, in a 15 hours session. 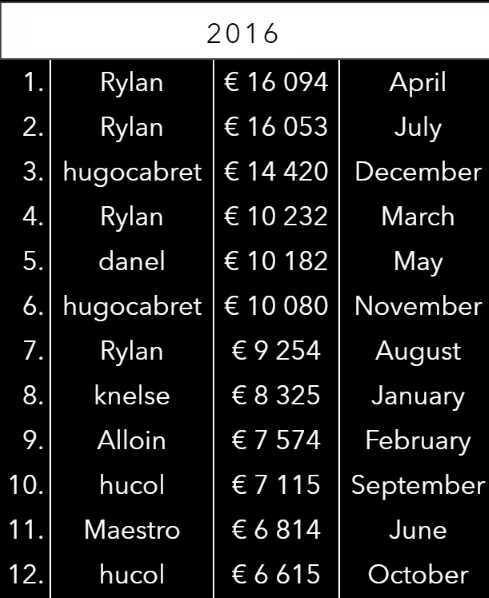 Must be good to reach the top of a 60k mountain. This achievement didn’t stop Maciej, who could have seized the moment to get into the resting mode, enjoying the well-deserved profits. 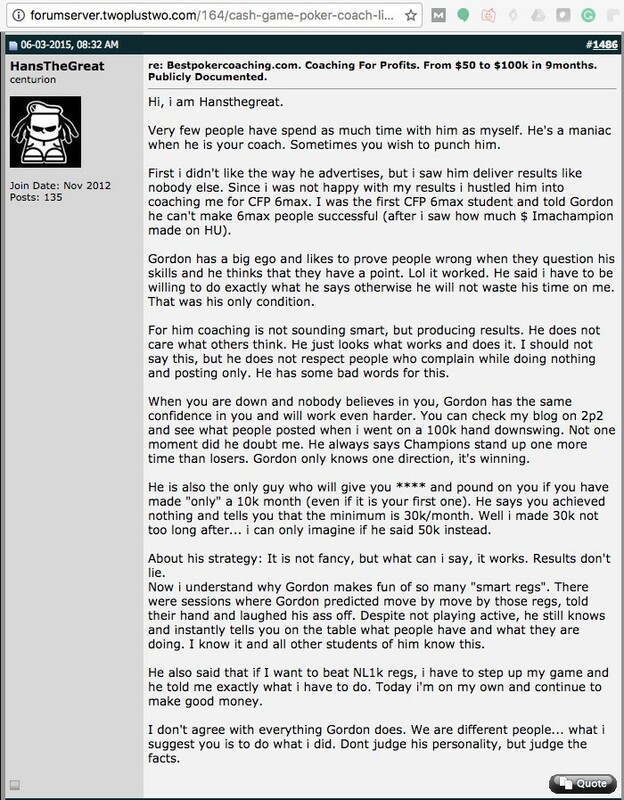 No, on the contrary, he opted to stay in BPC as a HU coach, giving back, starting to spread the magic among his students, like his coaches had done with him. 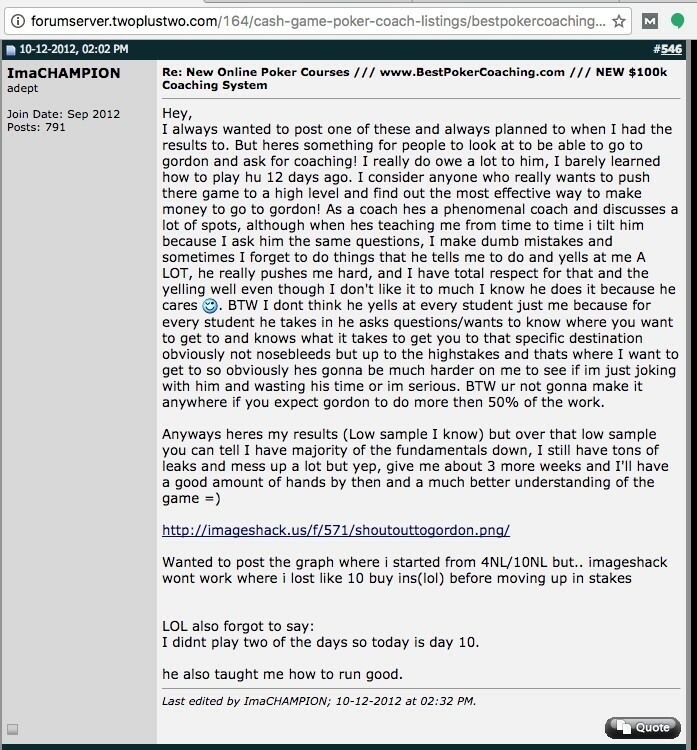 It seems that coaching is one awesome way to improve. 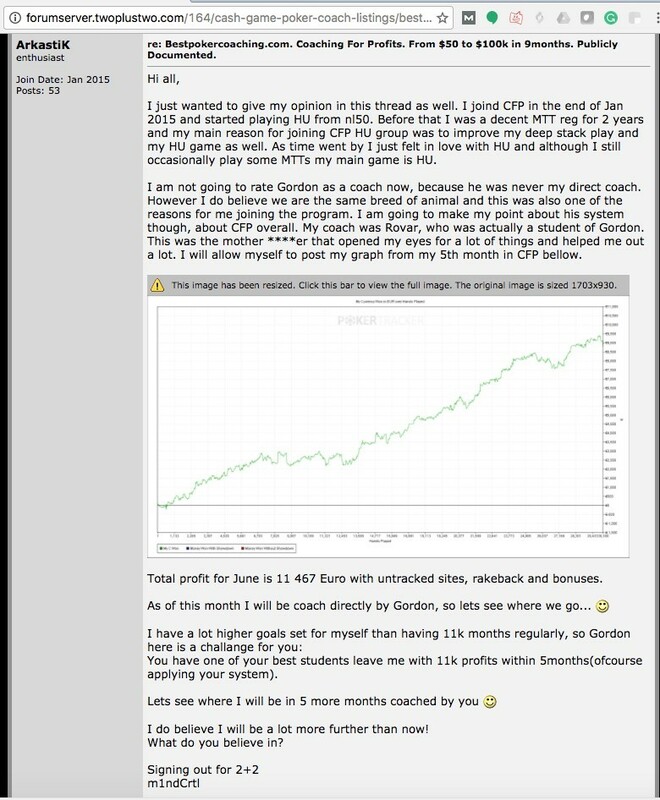 (Lauri later finished his own CFP contract, joining the growing list of winners and CFP finishers). 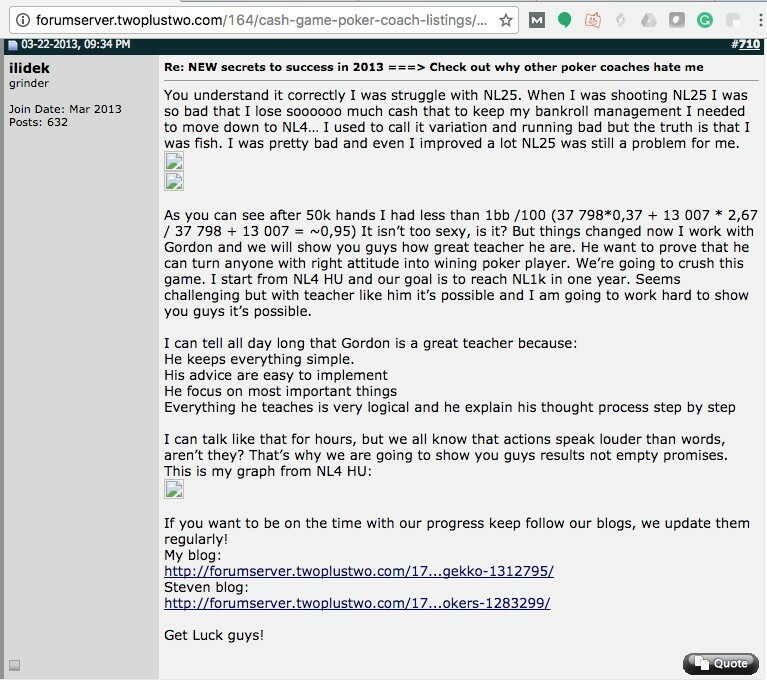 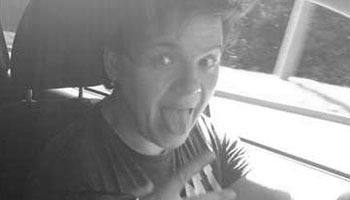 If you think Lauri is alone, check out the love his students continue to leave at his blog. 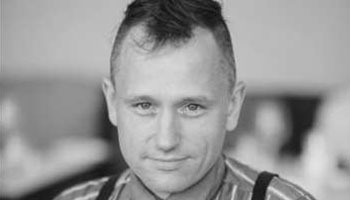 And Maciej? 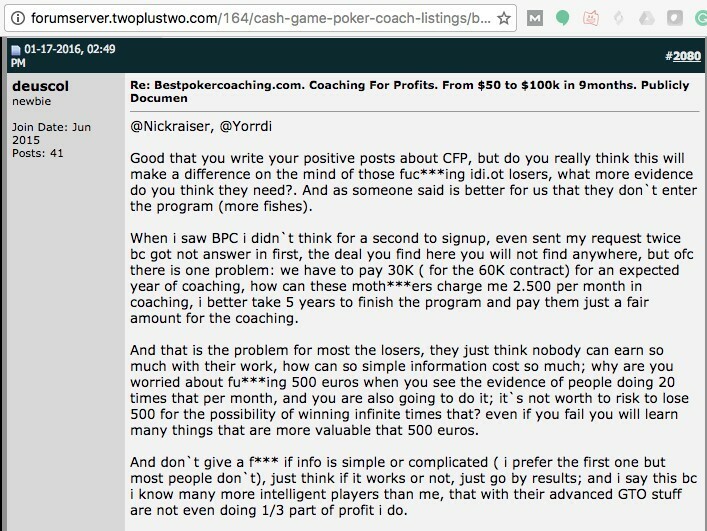 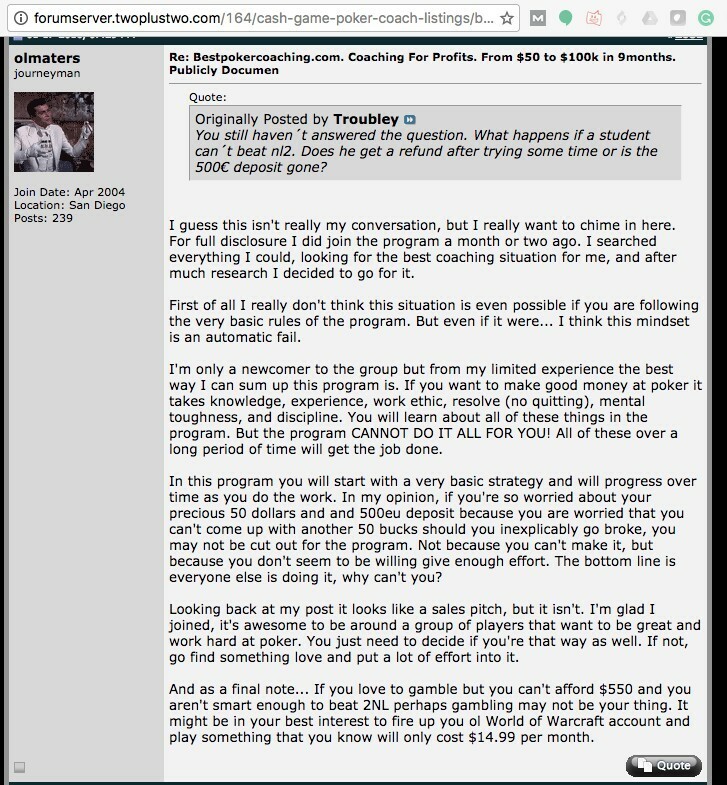 What does he think of BPC and the Coaching for Profits Programs? 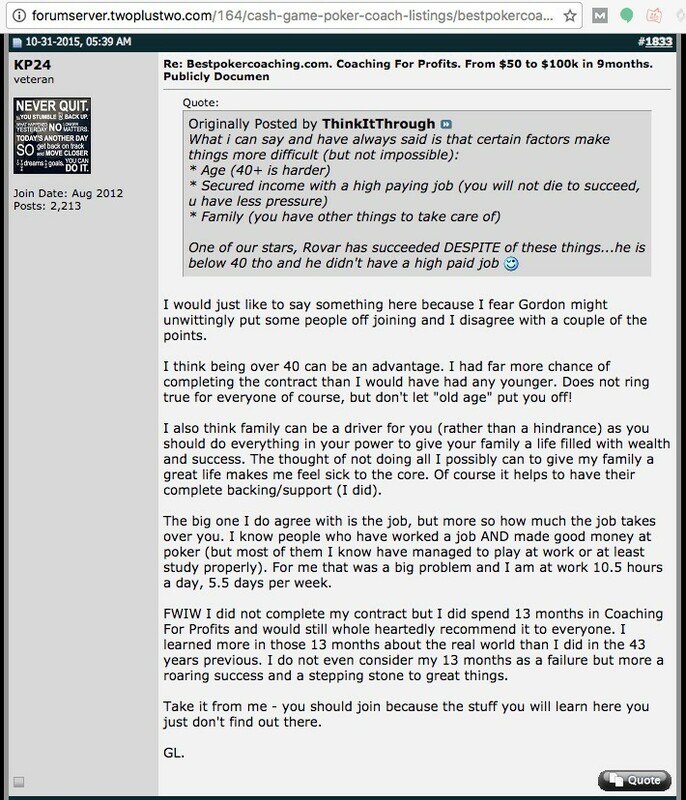 He continued to beat his own records, even after finishing his contract. 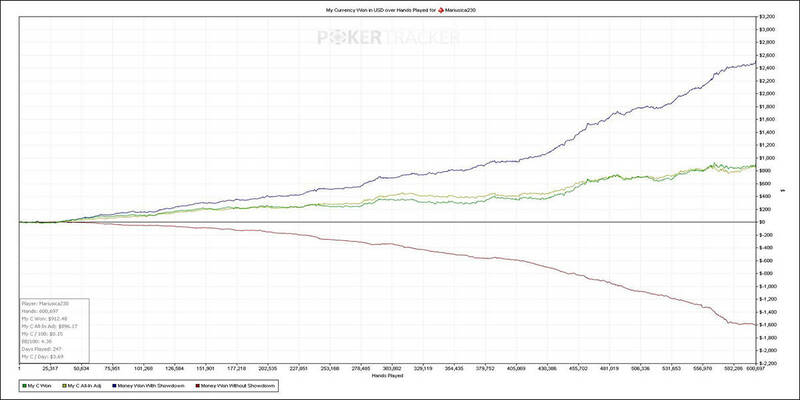 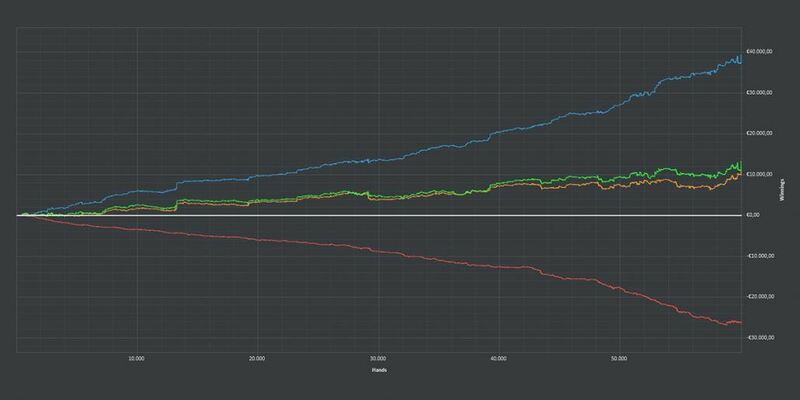 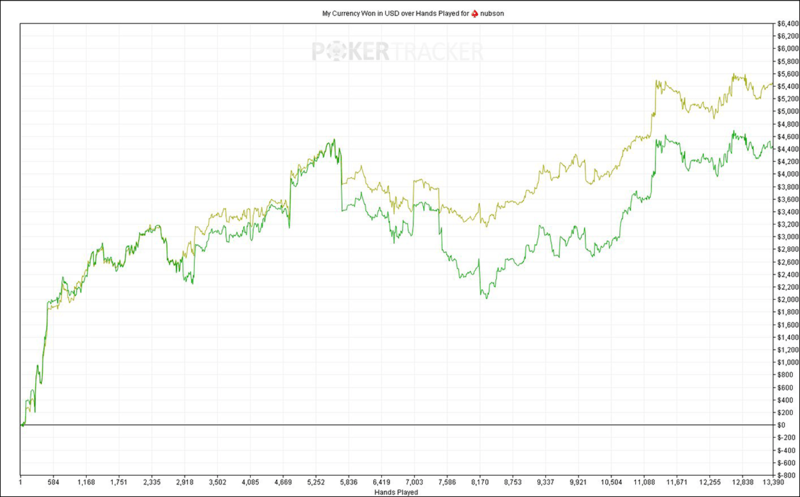 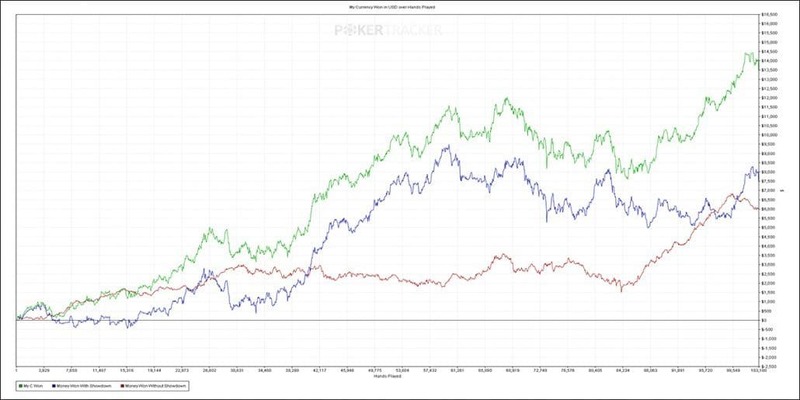 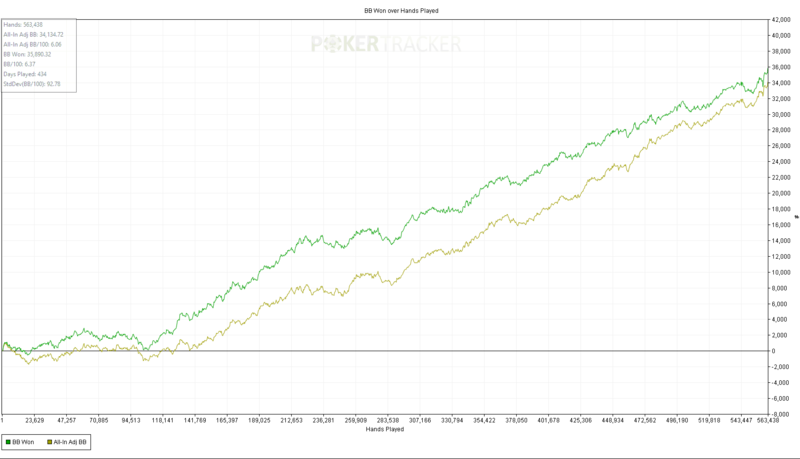 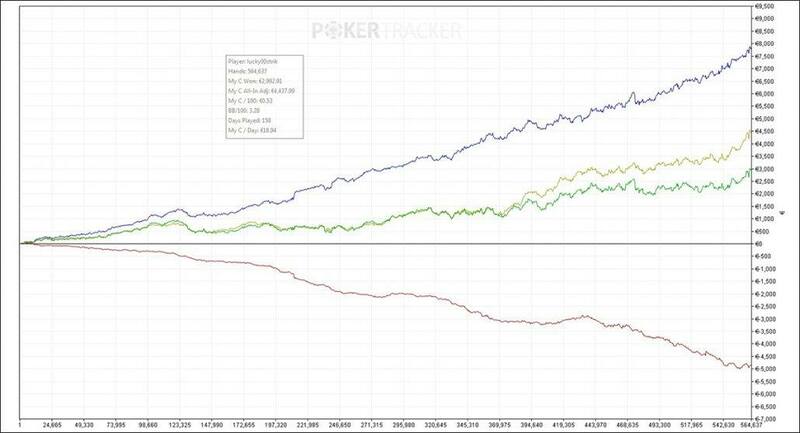 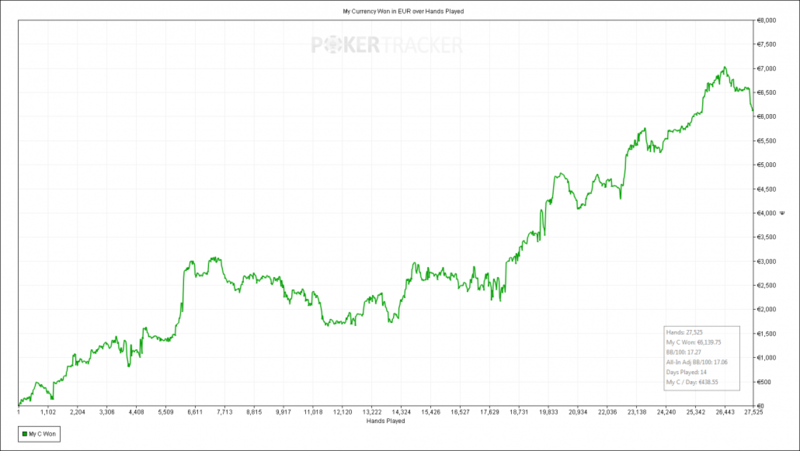 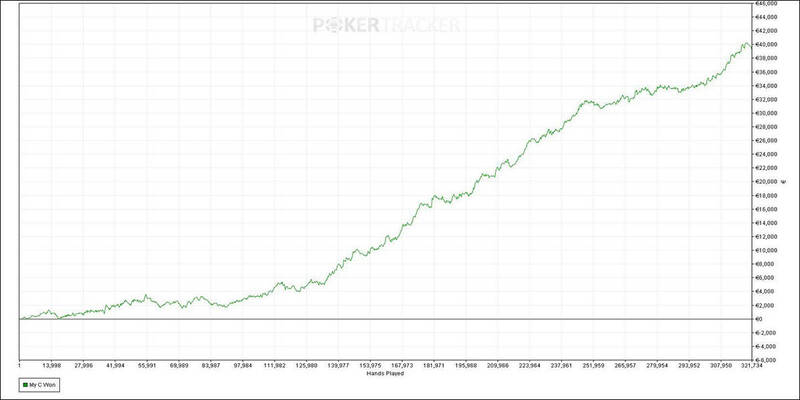 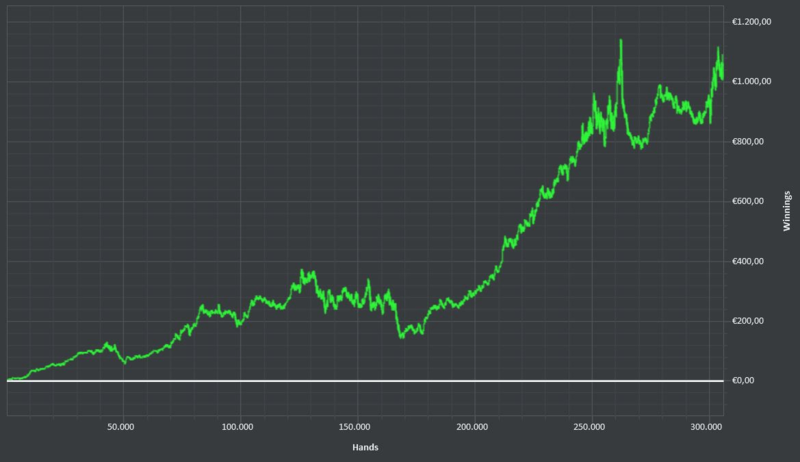 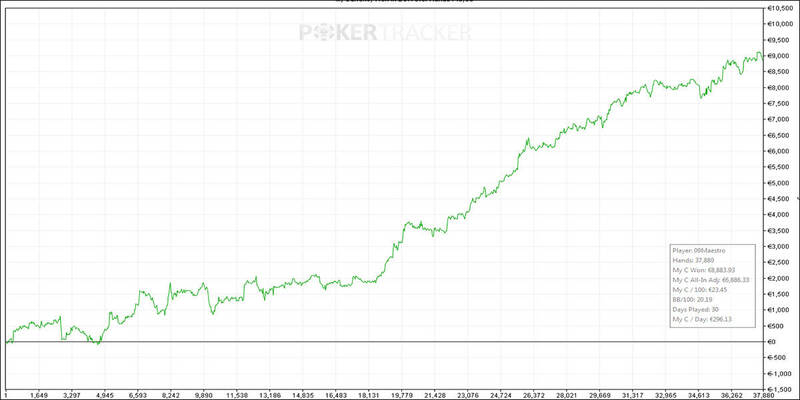 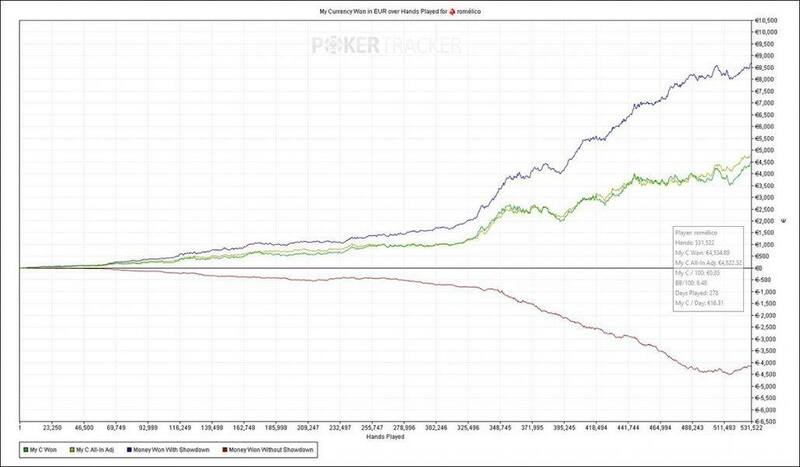 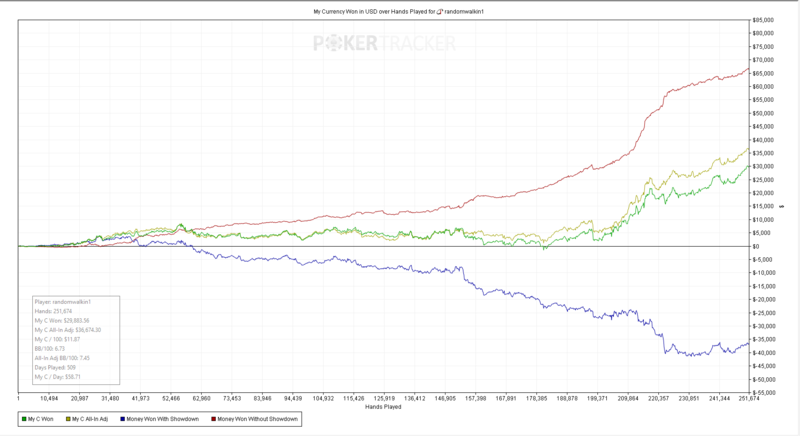 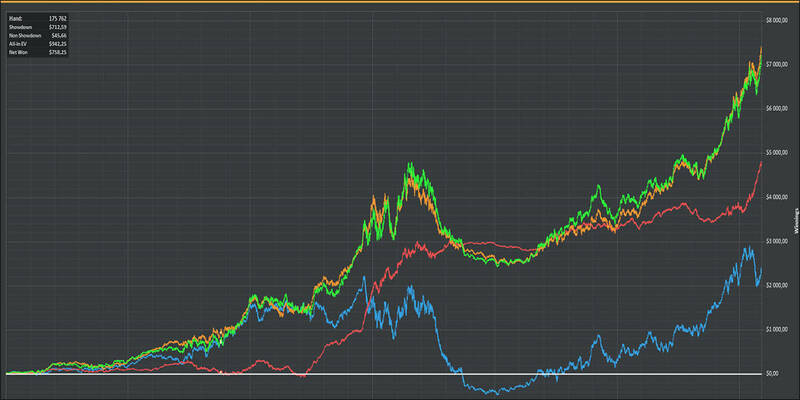 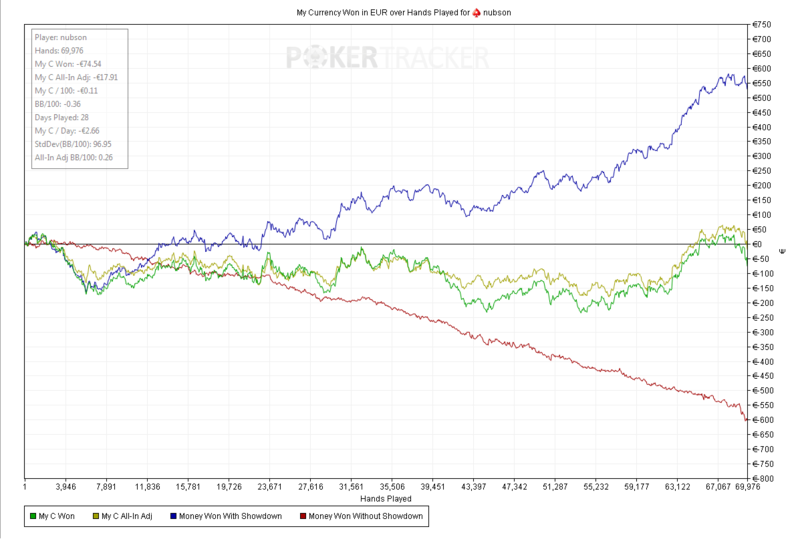 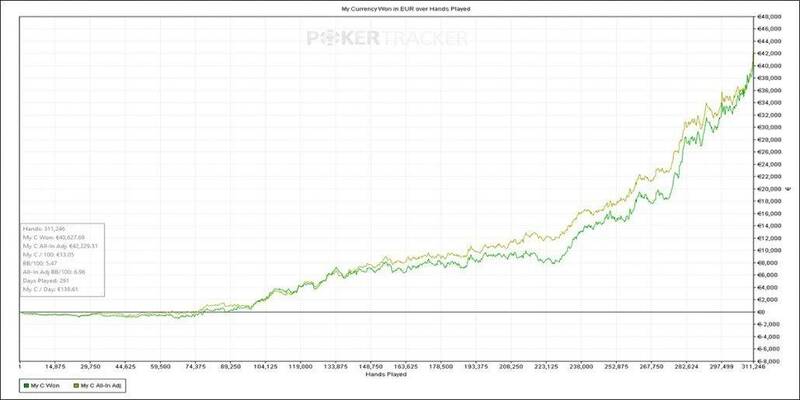 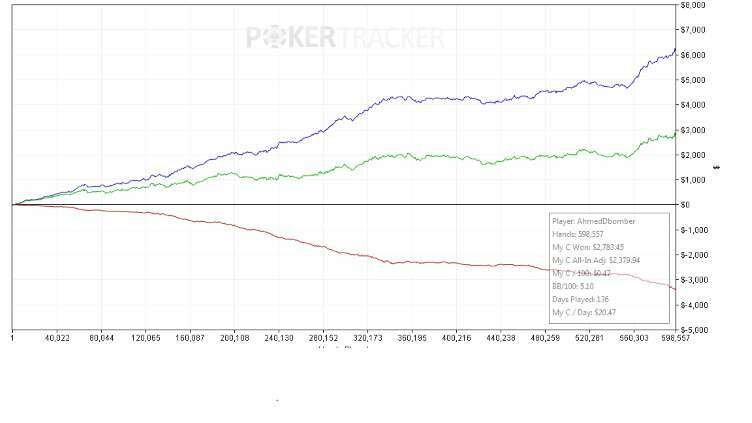 December graph from second poker room with more than 4000€, summarizing more than 10k€ in that month. “In April I won 12k EUR pre rakeback which is my current best month ever. 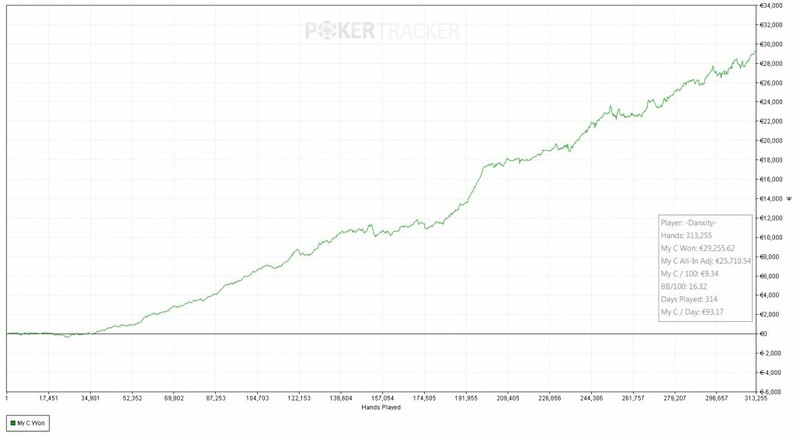 I’m a bit disappointed, at some point of the month I was close to 18k profits but nl1k games are pretty swingy and any kind of mistakes are really expensive. 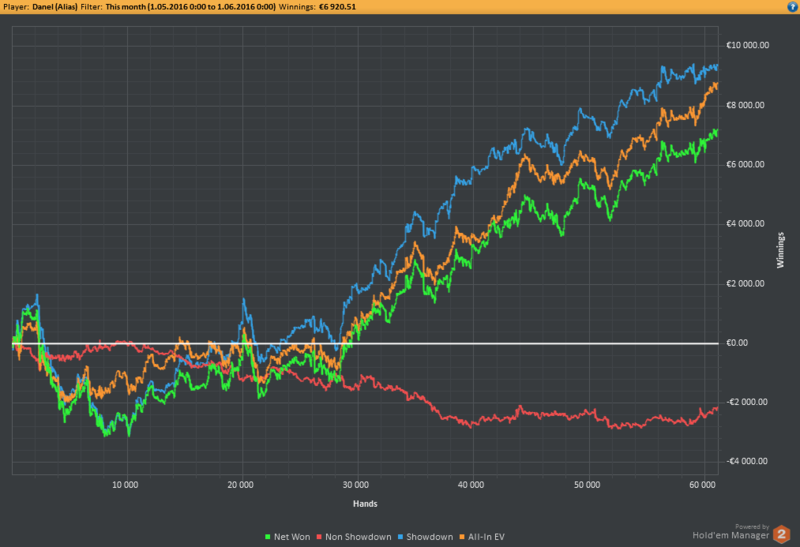 Long gone are the micros, more than 12k and still not happy. 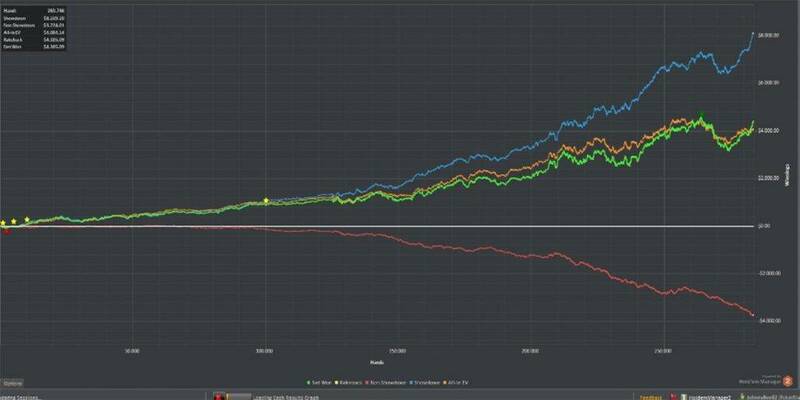 In July he broke his record again, with more than 16k winnings. 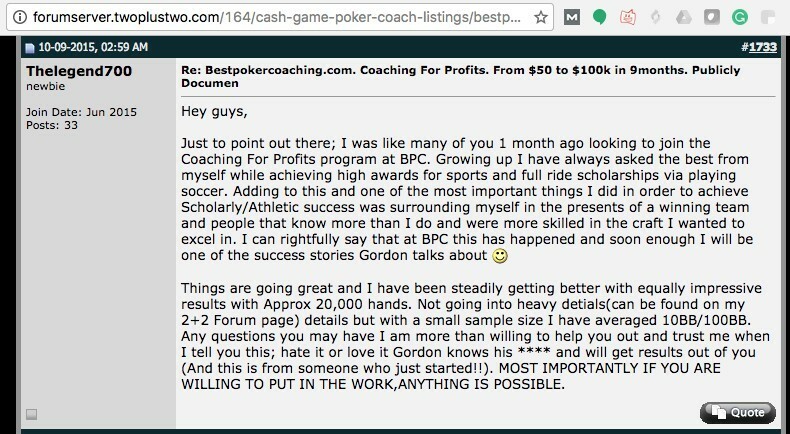 Yep, no mistyping here, more than 1k/hour to the man who started poker with freerolls. 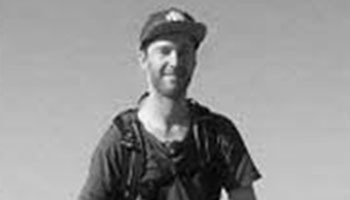 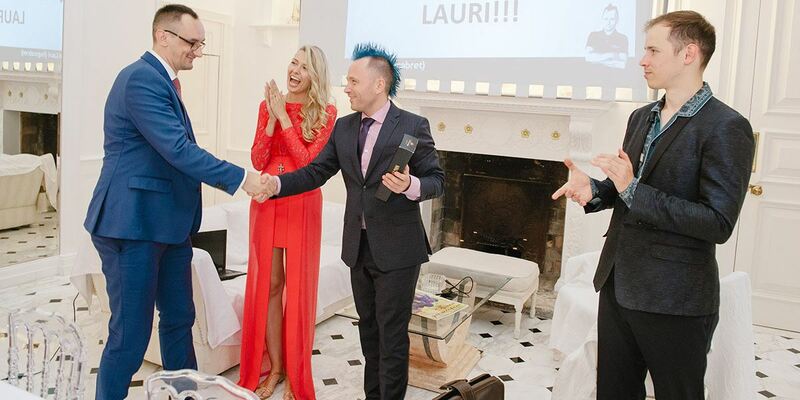 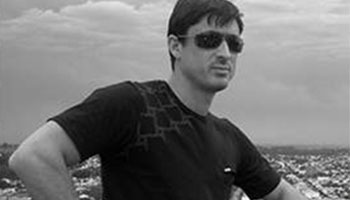 He proposed to his girlfriend in one of the most wonderful Croatia beaches, while attending the 2015 BPC Seminar. 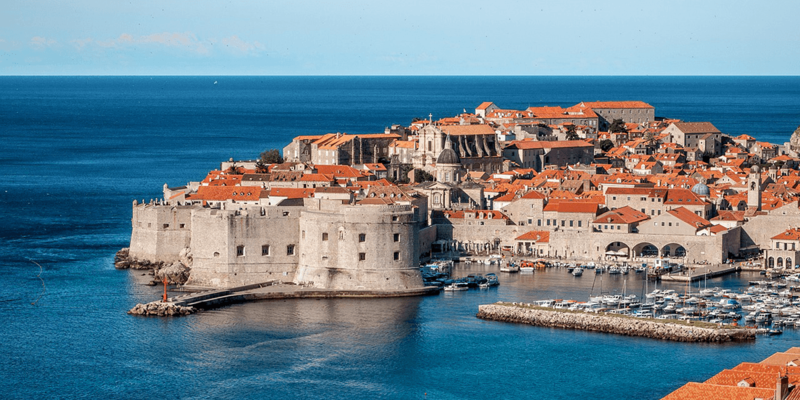 One of the views from Dubrovnik in Croatia. 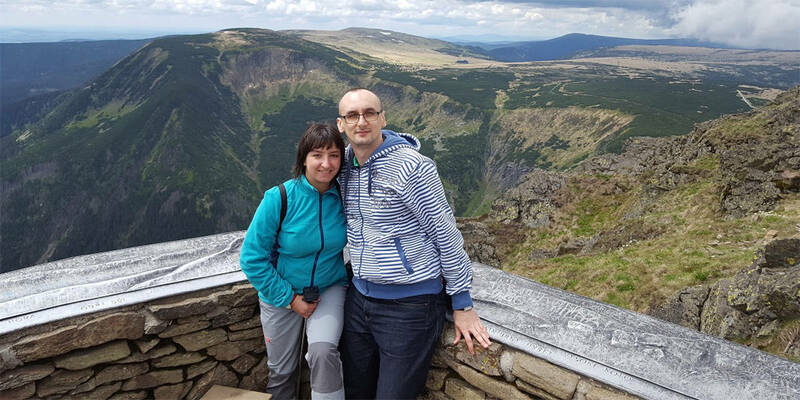 Maciej posing with his future wife. 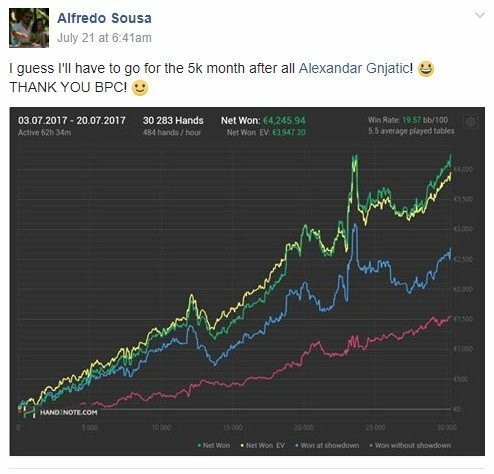 Following Croatia, BPC has rejoined every year. 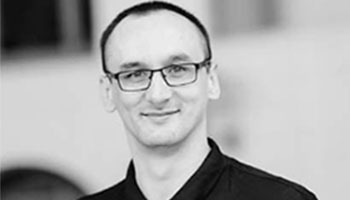 In 2016 Malta was the place where players and coaches reunited and once again Maciej was there. 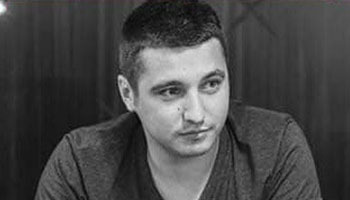 Malta, 2016, Maciej gets the trophy for 60k HU finisher. 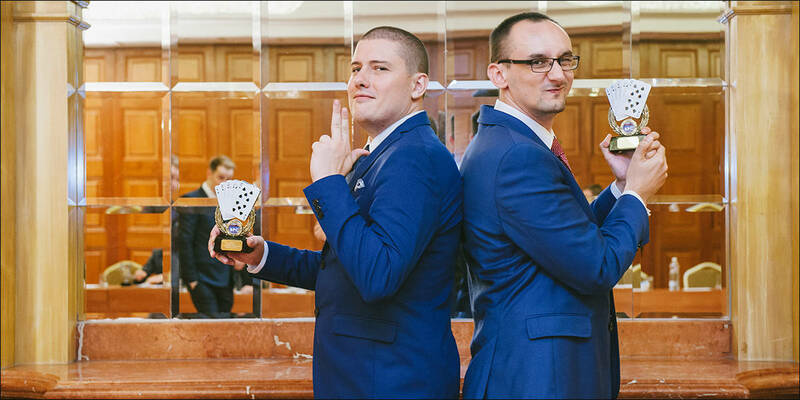 Ivan and Maciej, two CFP HU coaches, could also be a Poker Bond Duo. 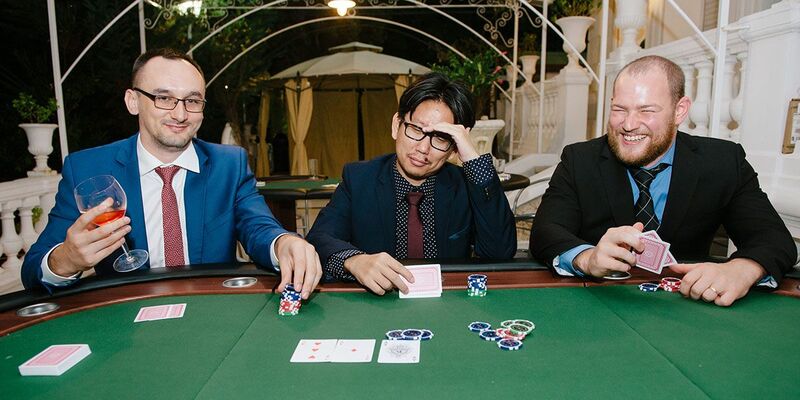 It wouldn’t be a BPC event without poker, right? 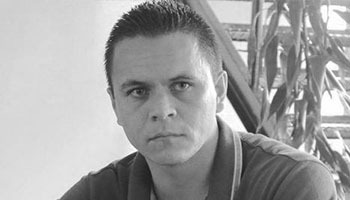 Even live, Maciej is always focused. 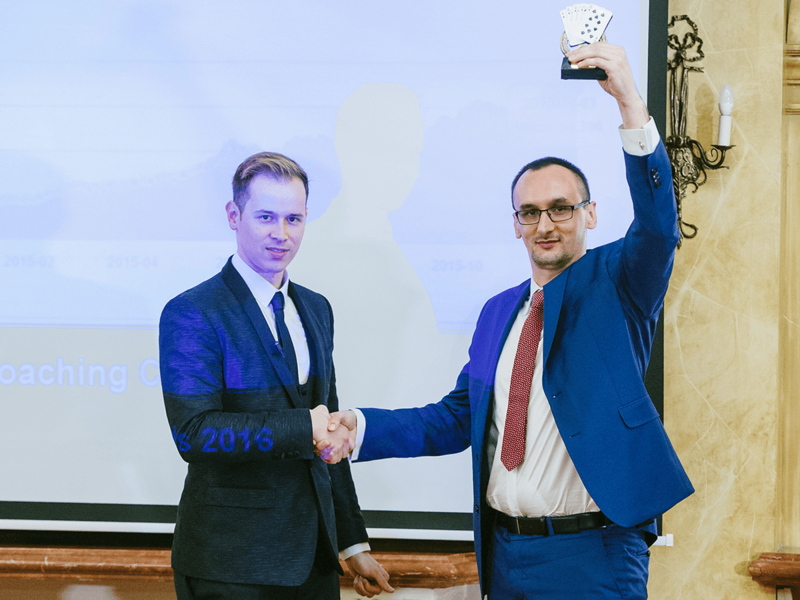 You can see the Maciej “Nubson” moment in this video of the award ceremony. 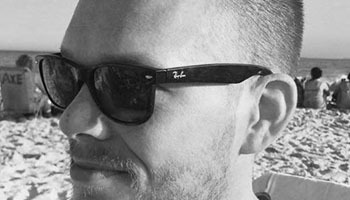 This September, Cannes was the chosen place to party and again Maciej couldn’t stay far. Who has the best hand? 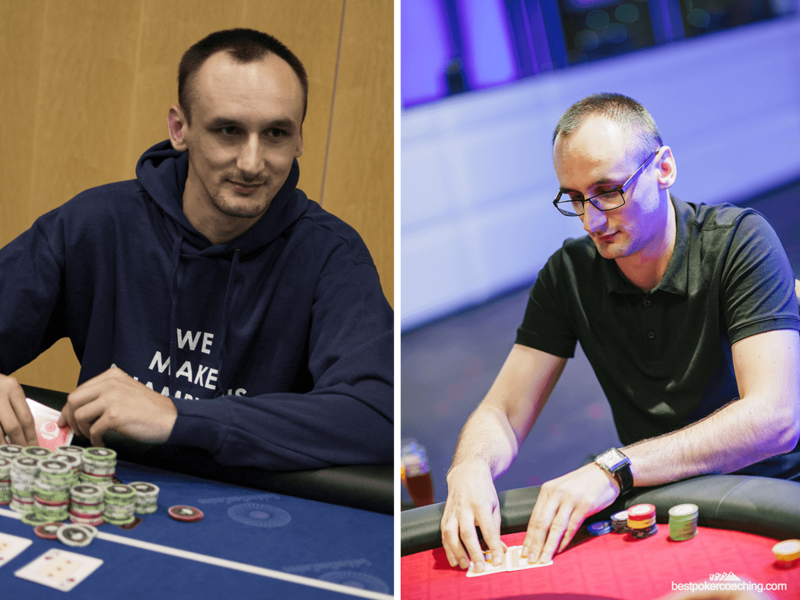 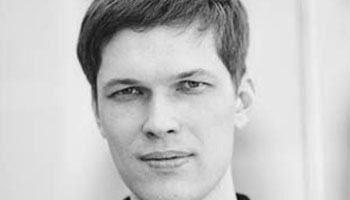 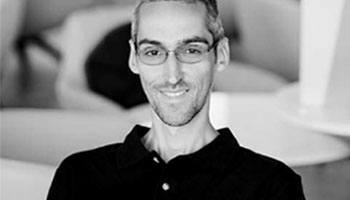 Following the rise of Maciej has been an inspiring experience, but what’s next? 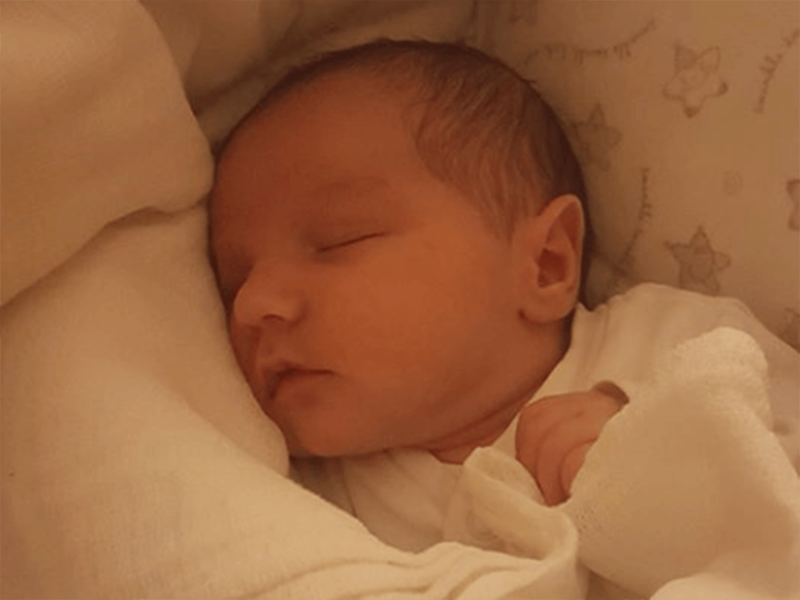 In February 2017 he shared with us the sweetest pic, the family just got bigger, with his first son. 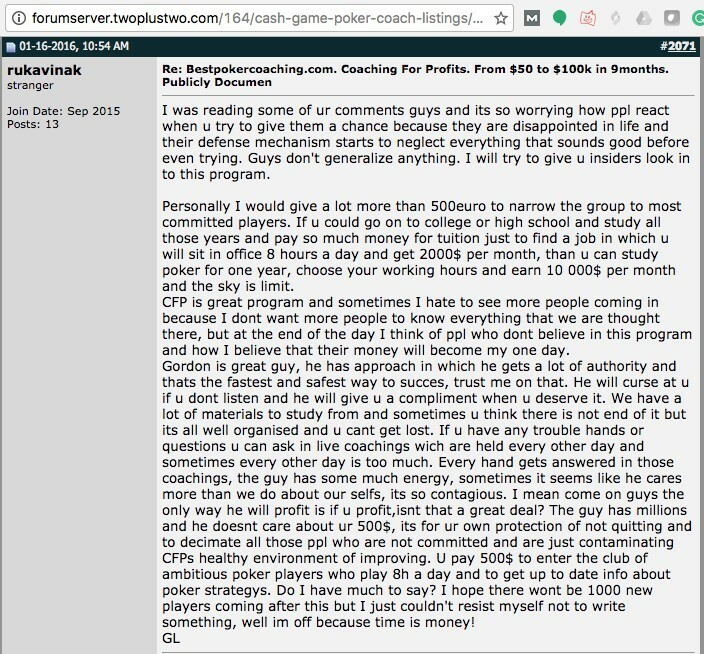 Future Poker coach? 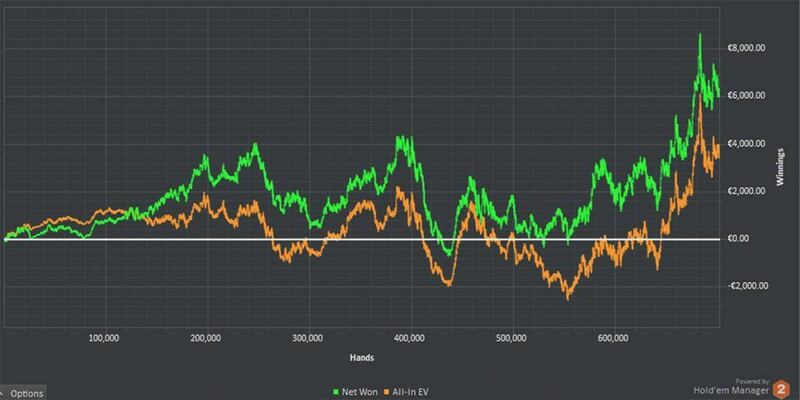 6-max or HU? 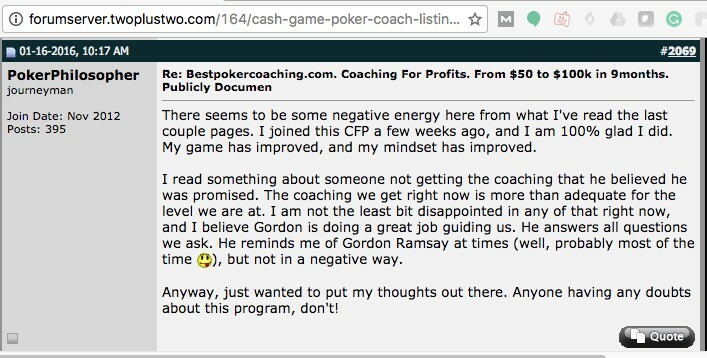 Whatever he chooses, looks like he’s already dreaming with the big pots. 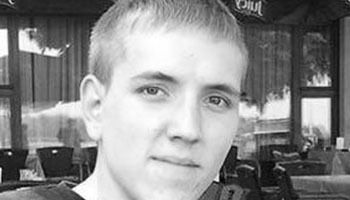 Having a kid didn’t calm the fire in Maciej. 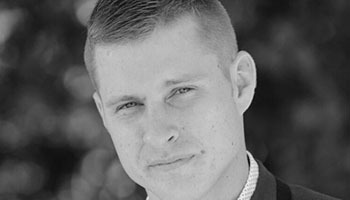 Like a true warrior, he searched for the next challenge. 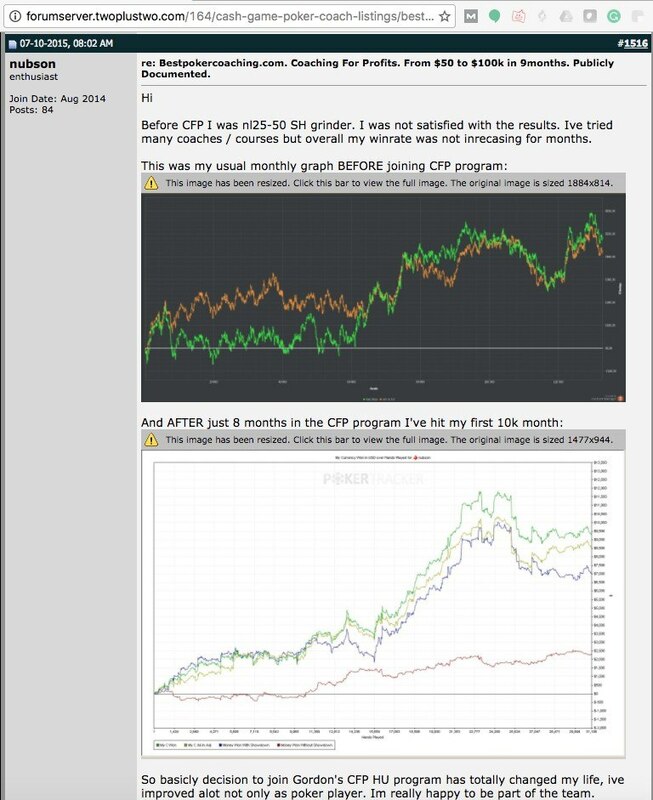 You can follow him on his new quest as he joined the CFP Iron Man 6-max program. 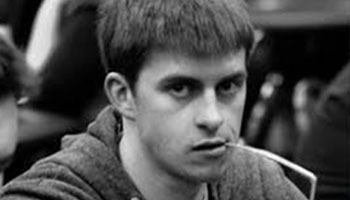 After a success like his, as a HU player, it may be difficult to start playing in a different format and readapt all your game. 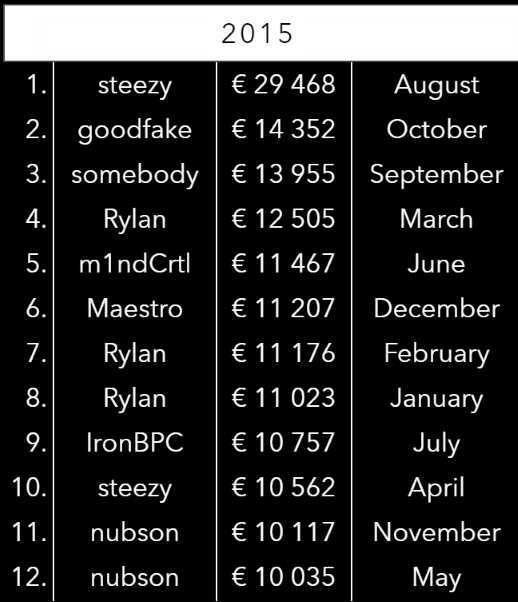 But we know that if someone can do it, that person is Maciej “Nubson”. 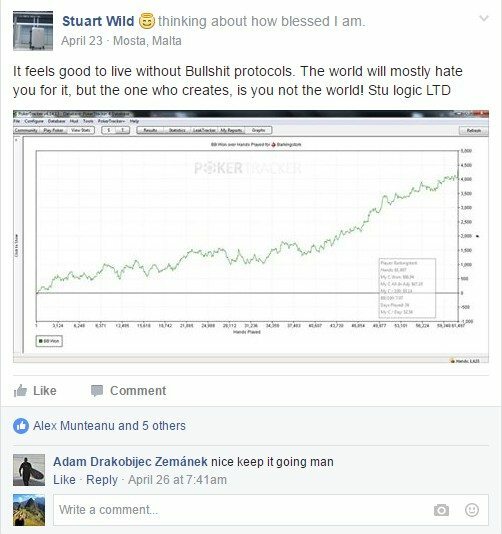 We already can see what he posted from this new adventure. 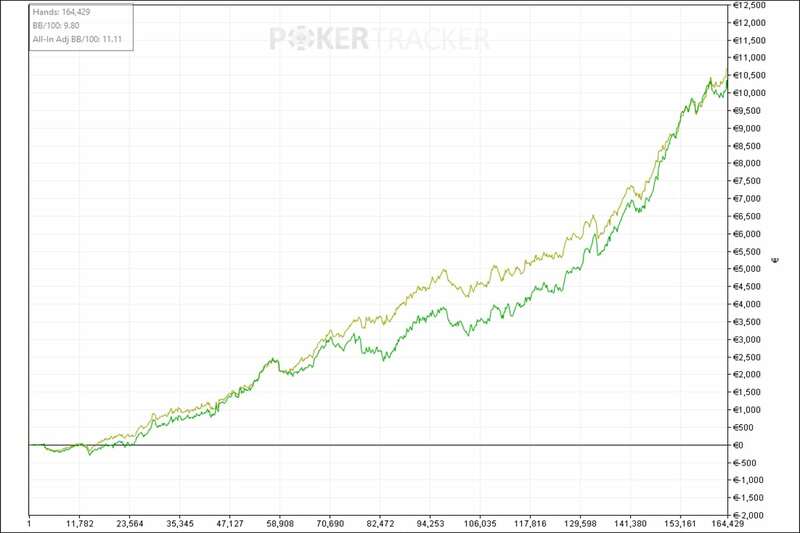 He changed an almost break-even March into a profitable beginning of April. Although the struggle is clear and the results are still negative, it seems we can already grasp a path to winning. 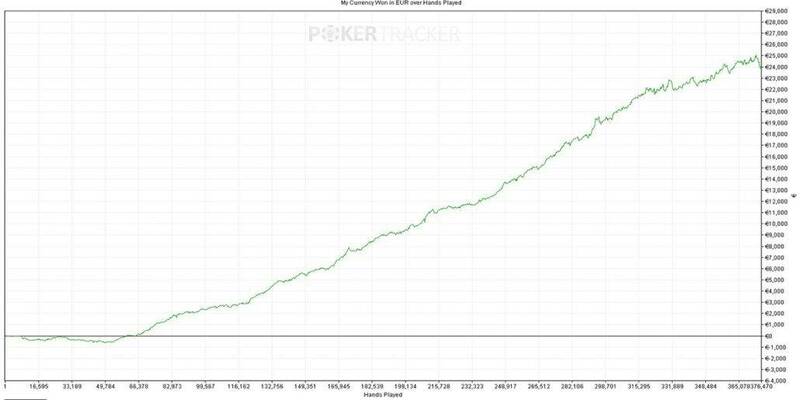 The following graph shows that the numbers are already positive and we believe they’ll keep growing. 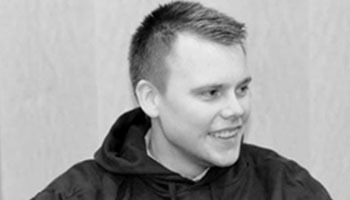 What can we expect to see in Maciej’s future? 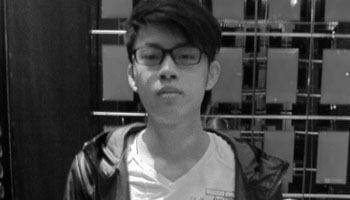 We never know. 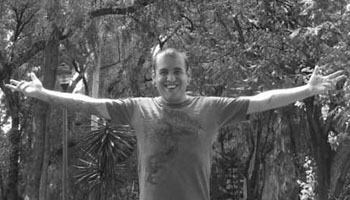 When he sets a goal, he reaches it, so we aren’t even sure if the sky is the limit for him.